Liz Pulliam Weston is a personal finance columnist whose twice-weekly columns for MSN Money reach more than six million people each month. 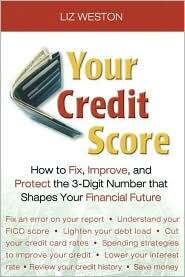 In her new book she provides a complete action plan for improving your credit score. Credit scores—numbers that sum up your credit history based on information in your credit report—have bearing on many aspects of life, including credit, insurance, renting a home and employment. A poor credit score can cost you reall money on credit and insurance. According to Library Journal, Weston "takes us through how and why they were developed, how to determine an individual's score, how to improve one's score, and how to deal with a "credit crisis" such as bankruptcy, divorce, job loss, and other events that can wreck one's credit score. She also covers two frequently overlooked areas, the effect of identity theft on credit scores and the correlation between credit scores and insurance rates." Weston, who is also the author of the question-and-answer column Money Talk, which appears in the Los Angeles Times and other newspapers throughout the country, is is a weekly guest on CNBC's Power Lunch and has appeared on NBC, Fine Living, PAX TV, and other networks. Formerly a personal finance writer for the Times, Weston has won numerous reporting awards. She was part of a three-member writing team that won a Gerald Loeb Award for coverage of the Comparator Systems penny stock scandal in 1997.